Lately we can see more and more people that are getting into the amazing sport of hiking in nature. 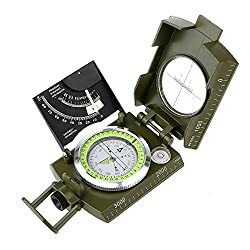 It doesn't matter if it's for a daily trip or a long trail, there are some essential items that are necessary to campers: a good map of the area is a vital part of the equipment, as are sturdy boots and an accurate watch, but by far the most important item may be a compass. 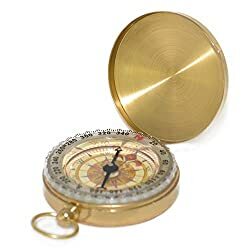 The compass has been around for centuries - a simple device that, as every lad knows, reliably points the way to the magnetic north. A compass can be a vital assistance in situations in which the hiker needs to know exactly where they are. These days, however, compasses have become fairly more sophisticated. It is still possible - and many recommend it as best to do so - to buy a simple, plain and ordinary magnetic compass, but the introduction of electronic devices with GPS technology has taken this category of products to an all new level. Buying a compass is about deciding on the one that is right for the purpose, and there are many things to consider. The faster the compass needle shows north, the better. Older compasses sometimes can be slow - meaning it will take the compass some time to adjust and fixate on the correct direction. This is not a big deal in most cases, however when you are outdoors in bad weather you definitely want to find your way as fast as possible. As all other equipment for hiking, the compass must be durable as it will probably get bumped in your backpack, fall out of your hands or on the ground at some point or just withhold bad weather and conditions. This can happen quite more often than you think, especially because you might also be holding a map at the same time as using the compass. Declination Adjustment - The north shown by a magnetic compass is not true north. Some iron in the ground can causes a deviation from the real north, which varies in different locations and at different times of year, sometime causing a deviation of up to 30%. Maps are always drawn to represent true north, therefore this issue can be problematic. However, there are now compasses available with a declination adjustment feature. This allows for the hiker to input in their location and based on it the compass will then point to the true north. This is, quite obviously, a very useful feature. Needle Dip Correction - another relatively unknown aspect of the earth's magnetic field is that it will pull on a compass needle based to where it is in the world. The closer you are to the poles, the more distinct the effect. For this reason there are compasses that are specifically designed for different places on the globe. There are five officially recognized magnetic areas of the earth, and each has compasses specially assigned. Compasses with global needles are particularly suitable for those who often travel and hike in different magnetic zones of the globe. the five different zones are: 1) North America, Europe, Caucasus, Russia, Kazakhstan, Mongolia, Japan and northeastern China; 2) Mesoamerica, North Africa, the Middle East, India and the rest of Asia except the Indochinese Peninsula, which instead belongs to; 3) together with sub-Saharan Africa until equator and South America minus Chile and Argentina; 4) Sub-equatorial Africa, Indonesia, Papua New Guinea, Chile and Argentina; 5) Australia. Some compasses come with a ruler in the base of it. This can come in handy when measuring map distances. Other useful nice-to-have features: a sighting mirror is a handy feature as it reduces possible errors when moving the compass from eye-level after sighting to waist-level for reading the dial. A clinometer allows you to measure slope angles (steepness) and is useful for assessing the heights of objects as well as avalanche hazards. A magnifying lens helps you to spot minor details (e.g. symbols) on a map. Glowing indicators allow you to easily use the compass at night. High Accuracy Built-in a bubble level can improve its accuracy and decrease its errors. Waterproof Feature, Durable metal construction. ARCHEER compass will work well in all weather conditions. Fluorescent Design Luminous design allows you to read data in dark . Built in adjustable luminous marching line, Thumb hold and magnifying viewer, Sighting hairline, Floating luminous dial and Liquid filled for fast readability! Multifunctions Foldable metal lid, Floating compass dial with 360� scale, Adjustable prism lens, Waterproof Shakeproof. This is also a clinometer, enable to measure height and slopes. High Strength Engineering Metal Working under extreme weather condition, suitable for Camping, Climbing, Boating, Exploring, Hunting, Hiking, Geology and Other Outdoor Activities. ?Note?This is a metal compass (about 328G). What You Get 1 x Compass, 1 x English Manual, 1 x pouch. ARCHEER's 40 days money back guarantee and 18 months hassle-free warranty with considerate customer service.